The one-time Washington defensive lineman seems headed toward a significant role in the Seahawks' tight end rotation this season. If it was the drafting of Shaquem Griffin that drew gasps of joy from Seahawks’ front office personnel and fans alike, it was the selection of tight end Will Dissly that allowed those in the team’s war room to finally exhale. Recall that the Seahawks initially passed on Griffin with the 120th pick in the fourth round when many figured the time had finally come for Seattle to draft him to instead take Dissly, a tight end from Washington and a player the team feels can play a vital part in reviving its running game with his in-line blocking. After taking defensive end Rasheem Green at 79 with a pick they got in a trade, and without a third-round pick of their own (it had been sent to Houston as part of the Duane Brown deal), the Seahawks had to wait for 40 more picks to pass before they could take Dissly, who they later said was a player they regarded as pretty much a must-have (Seattle then took Griffin at 141). And nine days into training camp, Carroll says the Seahawks are seeing in Dissly exactly what made him such a priority in the first place. With prospective starting tight end Ed Dickson remaining on the Non-Football Injury list, Dissly has generally been the backup tight end behind Nick Vannett. The Seahawks saw some early signs of what they hoped for out of Dissly during the offseason program. 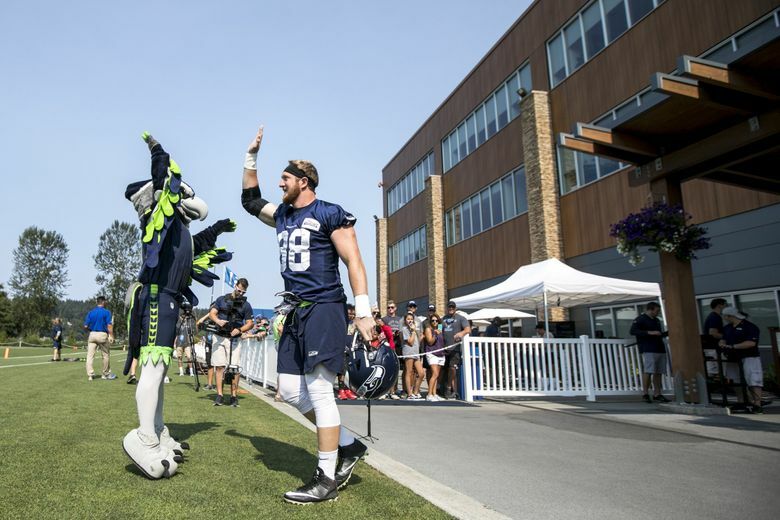 But since blocking is expected to be his forte — as Carroll said, “we really wanted his line of scrimmage stuff’’ — it wasn’t until the team put on pads after the first week of camp that Seattle could really get a sense of what it has in Dissly. Dissly’s first impression, the Seahawks hope, becomes a lasting one. Dissly on Saturday also showed off his hands on catches from Russell Wilson on two straight plays — one a short reception on third down to keep a drive alive and then a 15-yarder to set up a touchdown. Each was evidence of what the team thinks could be more immediate receiving impact out of Dissly than his reputation as a blocker — he was called the best blocking tight end available in the draft by analyst Mike Mayock of the NFL Network — might suggest. Pretty heady talk for a player who was a backup defensive lineman at UW less than three years ago before famously switching to tight end prior to Washington’s bowl game in 2015. But Dissly knows that nine days of training camp hardly a career makes. At the moment there seems little doubt Dissly will not only make the roster but have a key role on Sundays with the Seahawks likely to make great use of multiple tight-end sets. That’s an expectation formed during those anxious moments in April that haven’t changed in the months since, even if Dissly says all the team told him is what they usually tell rookie. The former Husky appears headed to a big role this season with the Seahawks.